You might not think much about your vehicle's headlights, until they burn out or appear less bright. But as Consumer Reports explains, headlights are an important safety feature that need maintenance just like the rest of your vehicle. TUCSON, Ariz. - Of all of the tests that Consumer Reports performs at its auto test track in Connecticut, this one might be the most unusual. CR tests the headlights, analyzing things like brightness and how well they light the road ahead on moonless nights. “We're looking for things like how do the low beams and high beams give you visibility straight ahead are they bright enough, is the pattern uniform or streaky and will they cause glare to an oncoming driver or someone that you're following," says Consumer Reports Car Expert, Jennifer Stockburger. 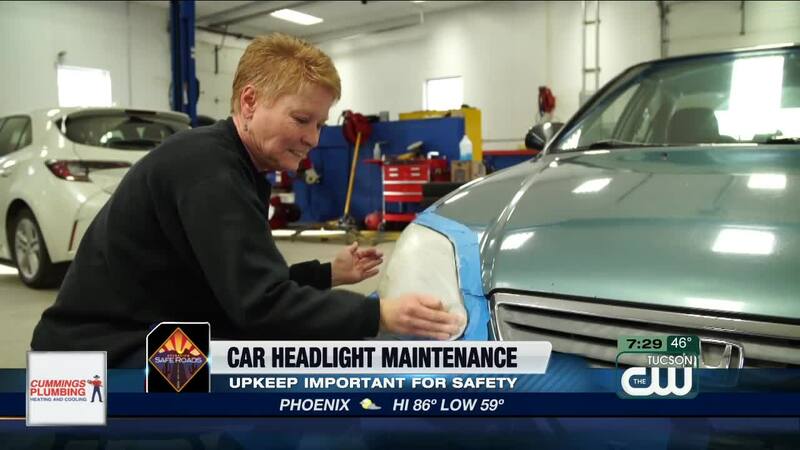 But if your car isn’t new, you might have realized your headlights aren’t in tip-top shape. Sun and the UV exposure can cause the plastic coating to become clouded or yellowed, giving off far less light that they had when you first bought the car! “You may find cars are more susceptible to this clouding if you are in an area where there is a lot of sun," says Stockburger. CR applied a restoration kit on one side of a vehcile. It took only about 15 minutes and the results were ILLUMINATING! The restoration kits restore brightness for about a year but most kits are less than $25. And CR says all that light, will make you a whole lot safer on the road. Before using any restoration kit, it's a good idea to watch the manufacturer's instructional videos online if available. Now If the lenses are clear but the lights appear to be dimmer than they used to be, CR says you may just need new bulbs. All bulbs dim over time and should be replaced after a few years.